Carte de France par departemens et divisions militaires. 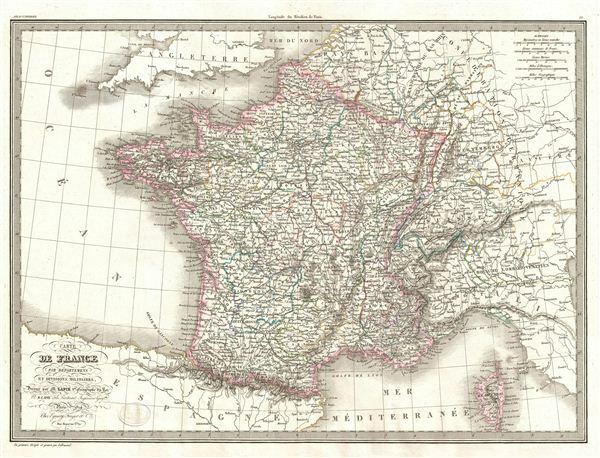 A fine first edition example of M. Lapie's 1829 Map of France by Military Departments and Divisions. Centered on France, the map includes parts of adjacent Spain, england, Switzerland, Italy and Germany. Lapie's map offers fine detail throughout with elevation rendered by hachure and political boundaries demarcated with outline hand color. This map of France was issued in the first days of the July Monarchy, a liberal constitutional monarchy under King Louis-Philippe. The July Monarchy would last until the Revolution of 1848 which saw the establishment of the Second Republic. This map was engraved by Armand Joseph Lallemand as plate no. 22 in the first edition of M. Lapie's important Atlas Universel. This map, like all maps from the Atlas Universel features an embossed stamp from the Lapie firm. Rumsey 2174.022. Phillips (Atlases) 754, 765.